LaserBrite Plaque Plates are premium brass plates for mounting on a wood plaque. Fabricated from solid brass (not brass plated steel) they are polished to perfection before being clear coated, then printed with classic marble designs. Laser engrave through the top color coat to reveal the clear coated brass which stays bright for years to come. Each plate has been elegantly adorned with a serpentine border for added distinction. 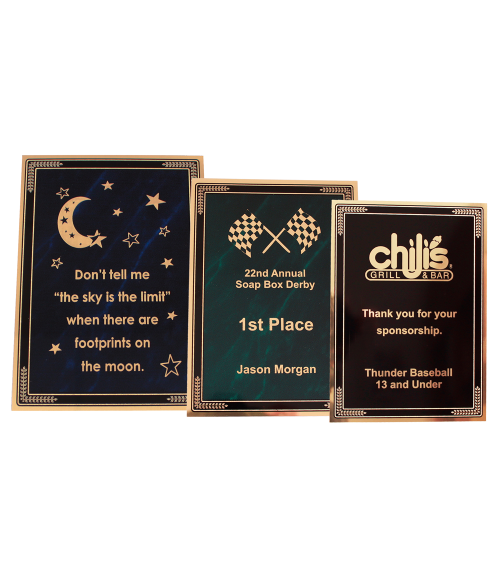 LaserBrite Plaque Plates are available in 3 standard sizes, blue, green or black marble finishes. A 35 watt laser was used to engrave the plate using 100% speed and 30% power. The thin top layer of color was easily removed to reveal the polished brass underneath. After engraving the plate can be applied to a wood plaque using Plaque Plate Mounting Tape.